In order to let you feel something of the Camino life, we decided to describe our daily routine. 1. Waking up. The time is usually 06:15, which is insanely early, especially since it´s egyptian dark outside. It´s really cold during the mornings, so we try to make ourselves enough tea as we can until we begin walking. The whole waking up part is really amusing since you do it with at least another 30-40 guys, most of them old french guys, who are doing exactly the same things (besides making tea). 2. Walking. The walking part devides into several different parts. There´s the morning part, in which we are still fresh and excited, so the walking pace is quite high. In this part we usually pass lots and lots of old french men who are doing the Camino as well. The sunrises are really great and everything is very peaceful. Most of the towns and villages that we pass in this time are still closed, since nobody in Spain wakes up before 10:00. After this part comes the afternoon part. By this time the sun is high and we get really hungry. But in Spain, nothing is open or serves food during the Siesta, so we need to find different solutions. And then comes the last part of the walking, which is the last part – the part in which we really want to get to the final point of the day, find our hostel (they are called Albergue de Peregrinos), pray it´s free (Donativo), throw ourselves into the showers, hoping there´s hot water and getting some real food finally. 3. Collecting stamps. We know, it sounds a bit strange, but we collect stamps, exactly as if we were 9 year old girls. We get a stamp in our Pilgrim Passport from each and every place we arrive to at the end of the day, and sometimes from unique places we pass thorugh. As soon as we can we´ll upload a photo of our passports so you could all see and laugh real hard. 4. Beating the old people. Everyday is a little bit like a race on its own. Everyday everybody, more or less, are doing the same part of the Camino. This is why everybody feel the undying urge to beat everybody else and reach the hostel before the rest do, to catch the best bed in it. Until you´ve seen old German ladies run, you haven´t seen running in your life. Ben Johnson – look out! 5. Snoring. Here´s an interesting fact that you probably didn´t know about old German men – they snore. Oh man, they snore like hell. Usually it starts very quitely, but very systematically, since this is they way the German do things. Little by little every other German man in the room joins the first who snores, and soon there´s a harmonic concerto of snoring. Noam finds it particulary funny, and this makes him laugh like a mad man on drugs until he falls asleep and join the whole snoring thing by himself. 6. Hunting beautiful girls (less than 65 years old). Well, there aren´t enough of them, but eventually we find them, and the rest is history. 7. Carrying backpacks. There´s nothing we can do but hate our backpacks. In spite all our afforts, they are still too heavy (between 12-14 kgs). This is frustrating since all the other people we see on the Camino somehow manage to get by with really really tiny backpacks, between 5-10 kgs on avaerage. But hey, what are 12 kilos in comparison to the horrible 15-30 kilos Yonatan & Shaul carried during Shvil Israel. 8. Missing home. Walking long distances make you figure out exactly what are the most important things that you have in your life, and that is exactly what you miss during the days, and during the nights. 9. Finding new stories. One of the most interesting thing in the Camino experience is meeting new people from over the whole globe and hearing their stories. 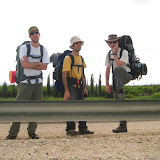 Finding out why did they go on the Camino from the first place, and what they try to acomplish. Most of them, as it seems, want to start a new chapter of their lives and hope that doing the Camino will give them the oppertunity to do so. We collect their stories, and the interesting ones – like the story about the blind man who´s doing the Camino with his wife, the girl without a leg who´s doing the Camino day by day, the 73 year-old man who´s doing the Camino for the 17th time, and many more – will find their way to the Hebrew guide we plan on writing when we go back home. My Twitter friend’s objections to the Camino were that, as he has no spiritual motive to walk the route, he couldn’t see what raises the Camino above other magnificent walks in Spain. The country is “full of rewarding and not necessarily so challenging walks”. There is a “perceived need to do it all”, which in most Camino routes means doing a month’s walking and there are many Camino snobs who believe ‘if you haven’t done it all it’s not valid’. (Check out the comments in the article mentioned above to see what he means.) And then there’s the fact that the Camino is so busy, like a ‘hiker’s motorway’.